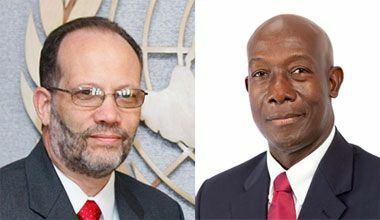 The upcoming Special Meeting of the Heads of Government of the Caribbean Community (CARICOM) on the CARICOM Single Market and Economy (CSME) will be the focus of a meeting on Thursday between, CARICOM Secretary-General Ambassador Irwin LaRocque and the Prime Minister of Trinidad and Tobago, Dr the Honourable Keith Rowley. The discussions will take place in Port of Spain, Trinidad and Tobago, the venue for the Special Meeting which will be held on 3-4 December 2018. At their meeting in Montego Bay, Jamaica last July, CARICOM Heads of Government recognised the need to keep focus on the CSME and agreed to have this Special Meeting on that issue. The meeting with Secretary-General LaRocque is the latest to be held by Prime Minister Rowley in preparation for the December session. In the past week he has met with the President of Guyana, His Excellency David Granger, Prime Minister of Grenada, Dr the Rt Honourable Keith Mitchell and Prime Minister of Barbados, the Honourable Mia Mottley, who is Lead Head of Government with responsibility for the CSME in the CARICOM Quasi-Cabinet. Prime Minister Mottley and Secretary-General LaRocque held discussions on Tuesday in Port-au-Prince with the President of Haiti, His Excellency Jovenel Moise on that country’s requirements to be fully compliant with the measures of the CSME. Over the last week, Ambassador LaRocque has met with a number of Heads of Government as he attended a meeting of the LIAT Shareholders and of the Leaders of the Organisation of Eastern Caribbean States (OECS) both of which were held in St Vincent and the Grenadines.